Jackson school was once the crown jewel of the Joplin School system and one of the first high schools in the city’s school system. $30,000 was set aside in 1889, in part for the construction of a high school, on land that had once been owned by the Joplin pioneer, John B. Sergeant. The school, located on the west side of the 400 block of Jackson Avenue between 4th and 5th Streets, was “a three story brick structure, the third story, of which consisted of two study rooms, and an auditorium which was used for the high school. The principal’s room on the second floor was used as the superintendent’s office.” The school was dedicated on the evening of December 12, 1890, by the editor of the North American Journal of Education, Maj. J. B. Merwin, of St. Louis. Jackson was expanded in 1892 due to continual student growth in the school district. Still, the school had a divided purpose. Its upper floors were used for high school students and the lower for elementary. For a photo of the school from around this time period, visit this link. It’s role as high school ended not long after the expansion, when in 1897, Joplin High School was opened down the street at 4th and Byers Ave. Tragically, it was in the process of moving the superintendent’s office from Jackson to the new high school that many early school records were accidentally burned by a janitor as kindling. Eleven years later, Jackson School received a radical renovation. Under the design of Garstang & Rea, the third floor of the school was removed, as well a large Romanesque-revival tower and peaked roof line. 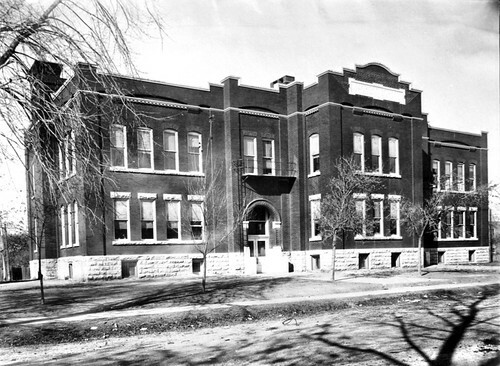 As one article described the reasons for the remodel were, “Its old style of architecture, and its inadequacy to house students of the district…” While it lost rooms on the third floor, four new rooms were added on the south side of the building for a total of twelve rooms.The photograph above reflects Jackson School after this radical renovation. For over thirty more years, Jackson School welcomed children to its hallways and classrooms. However, by 1932, the school was deemed no longer needed by the Joplin school district and sold to Porter Lea for salvage by the school board. Prior to its demolition, it had been vacant for approximately two years. Presently, an open lawn and the Red Cross sit where the students attended Jackson School. 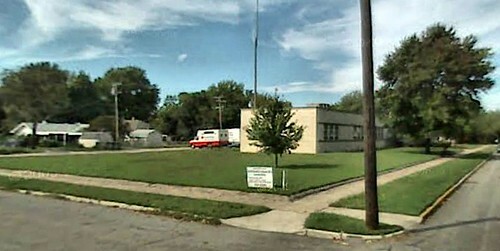 Former location of Jackson School.